We have a bit of a Frankenstein theme this week. I still couldn't let Peru go, there were just so many more things I wanted to try. I was ready to go ahead and put together another Peru bento when Lindsay from Apron Adventures was kind enough to drop off a grapefruit and grapefruit accessories basket from the folks at Texas Sweet. This of course got me thinking grapefruit theme, but I really wanted to stick with using the grapefruit on a subtler level rather than the more obvious fruit salad or fish with grapefruit slices and I still wanted to do a bit of peruvian cuisine. I found two recipes from each theme and I think they all pair nicely together, so I present to you grapefruitperu, citroperu, perufruit ok it's a confused theme we'll just have to roll with it. So our main entree is a grilled shrimp marinated in grapefruit bbq sauce. Dead simple to make, I ended up tweaking the sauce recipe because it came out a bit thin and I had hoped for a better coating, I also opted for a combo of both dijon and regular yellow mustard. The bbq sauce in general was quite pleasant and had a nice citrus twang to it. The original recipe called for rice, but since I have a starch component already, I went ahead and just served them on the skewer. I will say the suggestion to serve them as a po-boy would have been perfect, the sauce isn't so sweet or overwhelming that you could just stuff the shrimp in a bun and add a bit of bbq sauce for moisture and you'd be good to go. Back to Peru with Tallarines En Salsa De Espinacas or Pasta with Spinach walnut pesto. The ground walnuts lent a very creamy texture to the dish. I think the recipe suffered from either translation errors or simply badly written instructions. I muddled thru it and figured out what needed to happen. Basically you make a spinach walnut pesto, fry up some onions, and pork and mix everything together and toss it with the spaghetti. The color was very dramatic and bold which is something I liked, I think in retrospect I would have gone further to thin out the pesto as it's a bit thicker than I would have liked. This recipe was requested, you can find it here. Here you see Cebiche De Champinones, or Mushroom prepared Ceviche style. I was a bit skeptical on the idea of raw mushrooms marinated in lime would still chemically cook like fish or meat. Sure enough after a day worth or marinating the mushrooms did cook. I think I should have gone with the mellower red onion for the additional color. Serrano peppers round out the ingredients to give the dish some heat. I think the dish is still missing something. I'll have to think on it some more and experiment with some tweaks. 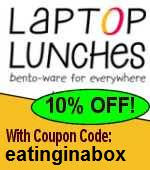 I think in the end I prefer the lightly cooked marinated mushrooms from my quickfire bento. The mushrooms might still be a little to raw for my tastes. I'll have to ask my diners to see what they thought. Finally dessert, back to the grapefruit theme, Grapefruit spice cake. I use grapefruit juice in the cake and the glaze, I think I could probably have gone with a bit more as it seemed like the cinnamon and nutmeg overpowered any sense of grapefruit in the cake. Still pretty tasty, I brought the extra loaf to work and it was gobbled up pretty quickly. Ok there we have it citroperu, citrusperu, whatever, it's a bit of a stretch when you think about it for a consistent theme, but if the Grapefruit fairy brings you grapefruit then you make a bento out of it. Thanks again to Lindsay for the grapefruits. It's been two tortuous weeks of no cooking for me. The rest was probably really good for me, but to be in the kitchen cooking again felt really good. It's my way of relaxing and having fun. Besides I'm a busy body, for two weeks there was a giant hole in my schedule where I had absolutely nothing to do it was freaking me out. Anyhow I digress, I had plenty of themes queued up but being so close to Valentine's day I figure it would be nice to send my diners a valentine's day dinner surf and turf style. I managed to save a few bucks in the previous few bentos so it allowed me to do a splurge this week. I kept the menu easy to make sure I don't over do it on my first week back. And of course I had my new toy, which I'll post more on in a bit. I can't say enough about my new found love of sous vide cooking. You really need to click into the photo to the right. Can you see it? It's a medium rare steak with maybe a 1 millimeter brown top. The whole thing is tender and melts in your mouth. I know this won't re-heat well, I'm just anxious to have folks over to the house to taste a perfect steak. If you don't know what sous vide is, let me give you the quick overview. I'm planning on doing a detailed post of the sous vide supreme I just acquired and it will have more detail. Basically you take (in this case) a steak, put on whatever seasoning, vacuum seal it in a bag and dump it in a water bath at the perfect temperature you wish the whole thing to get to and wait a few hours. It's simplistic but generally speaking you lose nothing to the pan, nothing to evaporation, yes you still cook from the exterior in, but you're just slowly bringing it to the right temperature rather than violently overheating the outside to get the inside to cook. Ok more on this later I promise. Just take it from me, it's awesome and can be applied to lots of things. Ok enough about sous vide what exactly was the main entree? Steak Au Poivre with a Shallot and Wine Demi-Glace. Ok It's *almost* Steak Au Poivre, The peppercorns fell off during the sous vide bath so I went with blackpepper and salt to try to form a nice crust (which it did) and put together a nice Shallot wine demi-glace reduction. No, I didn't create a classic demi-glace I cheated and went with re-constituting some concentrate very very tasty. I wish that I was able to get together the peppercorn crust, that would have made this perfect, but I'm very happy with the results. Again, the Sous Vide Supreme produced an amazing steak. My only regret is the reheat will destroy the perfect medium rare. I'll have to work on that one. I had some extra and carved off a small piece to taste this morning and even cold it was delightful. Next we have Sage seared sea scallops salad with raspberry vinaigrette. For the Surf I went with a seared sage dusted scallop. It blackened more than I would have liked but the resulting salad was pretty good. The sweet scallops offset the bitter spring mix and vinaigrette, and I managed to get the scallops to a perfect temperature, so assuming no re-heat attempts this should be a really great salad. The beautiful red from the raspberries go well with the valentine theme, lots of herbs in this one so it's very fragrant too. Let's see what my diners have to say, but I think they'll be happy with the results. Needed some starch and filling so I went with a Spinach and Parmesan Orzo, easy dish to put together some prep on the carrots, onions and spinach and just waitin for the pasta to come together. A little parmesan brought some salt into the equation, I refrained from adding more as I tend to have a heavy hand with salt. I love the texture of orzo, being that it looks like rice, I always have the expectation that it would be more "toothy" except it's soft because it's pasta. Last but never least, what Valentine's day bento would be complete without some Chocolate Covered Strawberries. I did a familiar tuxedo with white and semi-sweet here. I'll confess it's not my best detail work, but I was in a bit of a hurry. But it's a nice special touch I can bring to my bentoers. Hopefully my co-workers will enjoy the extras tomorrow. I'm very glad to be back. This bento took no time at all because I cut down to six portions. I'm sad I can't cook for everyone, but the previous schedule was killing me, and as much as I'd like to please everyone that just isn't always possible. Sorry about the lack of post, as I said I'm on hiatus for medical reasons. I'll be back very soon I promise.